“It was one of the first papers I wrote in grad school,” says Dr. Virginia Espino about her research with respect to a lesser known chapter in the history of LA’s medical establishment. She could never have imagined, she says, that her work towards a doctoral degree in history at Claremont University under the supervision of Professor Vicki Ruiz would become the cornerstone of a powerful new documentary film. The film, No Más Bebés, is an in-depth look at a landmark lawsuit filed in 1975 on behalf of Mexican immigrant women who had been sterilized by physicians at Los Angeles County Hospital. The sterilizations, according to court records and the unpublished ruling were deemed legal because of a population control mandate from the highest echelons of the U.S. governmental and policy institutions. It was the inevitable legacy of a eugenics movement stretching back to the early 1900s that viewed the fertility rate among people of Mexican origin as a potential problem that could ultimately overburden the city’s infrastructure. Roughly ten years in the making and completed this year, the film is co-produced by Espino and on a fast track to national and international acclaim for its director, Los Angeles native Renee Tajima-Peña, an Academy Award-nominated documentarian who is perhaps most known for the film Who Killed Vincent Chin but whose credits as a director and producer include My America...or Honk if You Love Buddha, Calavera Highway, Skate Manzanar, and Labor Women. Raised in Highland Park, Espino was still a student at Franklin High School, when she began to identify with the progressive political objectives and cultural activism many Mexican American student and community leaders espoused as a result of the turbulent upheavals in LA’s predominantly Chicano East Side in the latter part of the 1960s and through most of the 1970s. “I remember going to see the play Zootsuit at the Pantages theater with M.E.Ch.A (Movimiento Estudiantil Chicano de Aztlan),”says Espino of her membership in the once widely popular inter-campus student organization that took root in high schools and colleges in the aftermath of that vibrant historical period. “I think we were one of the few high school M.E.Ch.A. groups still around then.” She recalls being awed and impressed by the production, a musical play based on the zootsuit riots in the 1940s. A transfer student from Pasadena City College who finished her undergraduate education in Psychology at U.C. Santa Cruz, Espino returned to LA and ventured even further east of LA’s Eastside to Claremont Graduate University, where she was mentored by Professor Ruiz. “She’s the foremost Chicana historian, and she focuses on the intersection of race and class and gender,” Espino says. She had grown up, she confides, in a household where the images of civil unrest and movimiento manifestations, were buffered. Her parents were, she says, under the somewhat sad illusion that they could truly assimilate and leave their Mexican American identities behind. “My parents both graduated from Lincoln. My father played football. My mother was in the Glee Club. They believed that if they did everything right, they could have the Leave It to Beaver life,” she reveals. She herself, however, was conscious of how the turmoil occurring on the streets was related to the Mexican American or Chicano movement that had spread across the state as part of a larger social upheaval in reaction to Vietnam, the farmworker struggle led by Cesar Chavez and Dolores Huerta coupled with the African American community’s on-going fight for civil rights and an end to racial discrimination. At Claremont, she began an investigation centered on the women who had been coerced unwittingly into a surgery that would prevent them from bearing more children and what had ultimately befallen them. Many, she says, had signed a consent form they did not understand while still in labor or under heavy medication. “I didn’t interview any of the women,” Espino says. “I didn’t want to impose on their privacy. I interviewed the activists, the lawyers and the whistleblower, Dr. Rosenfeld.” The more she uncovered, the more horrified she became that so many East LA women had undergone tubal ligations as a matter practice, a policy executed by Dr. Edward James Quilligan, an obstetrician and his staff. Also among those she interviewed was Antonia Hernández, the now well-known former head of the Mexican American Legal Defense & Education Fund (MALDEF), who had begun her career by filing the class action suit on behalf of the ten plaintiffs seeking justice for the sterilization surgeries performed on them without their informed consent. Tajima-Peña, she says, was equally disturbed at the idea that this had occurred in her own back yard only a few decades before. The two had come of age when reproductive rights for women had finally been granted full protection under the law. It was within that context that the plight of the women directly affected by what was actually a state-sanctioned population control effort took on a greater meaning for both Espino and Tajima-Peña. In the case of the plaintiffs, their right to have children was denied in a kind of inverse corollary to the reasons behind the movement to insure women the natural right to determine their own reproductive destinies and practices. Their playground conversations were the genesis for the film. The film is anchored on this juxtaposition. And although the plaintiffs were unsuccessful in court, No Más Bebés brings several of them together, along with Dr. Bernard Rosenfeld, the young intern who first reported the alarming practice. A number of the defendant physicians appear and seem to believe there was nothing wrong with what they did. The film also features the activists and the lawyer who got behind the women—among them LA County Supervisor Gloria Molina, then a fiery young political activist—as well as Hernández, their chief legal representative. A recent selection at the Los Angeles Film Festival, where it sold out two screenings, the documentary will air on P.B.S in November, according to Espino. 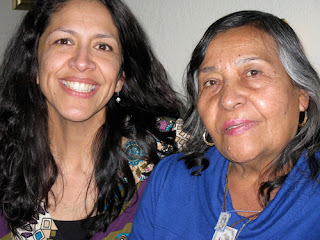 Still close to Dolores Madrigal (pictured with Espino above), the lead plaintiff, whose life was nearly devastated as a result of her sterilization, Espino looks at her own contribution to the project as part of a historic multi-ethnic feminist legacy. She understands that her efforts are part of a larger struggle help these women reclaim their dignity and integrity as human beings. This in turn will remind us all that we still have so much further to go before true gender and racial equality can flourish in the world. And it will provide a guide post in the struggles for reproductive justice and women’s rights across the globe.